Yes, I spent an entire day making cut files for all 50 states that you can download and use to your heart’s content. But a word of warning, if you’re from one of those itty bitty states up in New England (or any state, really) and you see there’s a problem with your state, give me a shout so that I can fix it up. Some states were such a bear to draw and I hate the idea of you having a wonky, messed up state! In Silhouette Studio, take your Silhouette State Cut File and size it appropriately for your shirt. Add in any words or shapes that you’d like to incorporate. 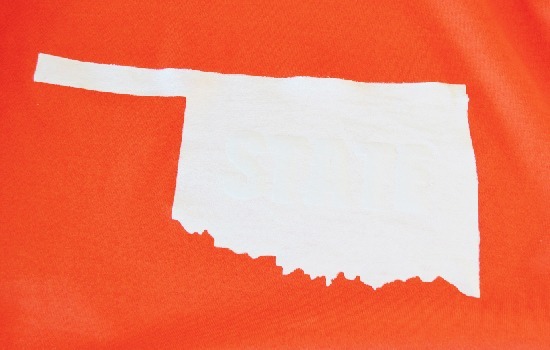 I used a heart one one and the word “state” for an Oklahoma State University themed tee shirt. 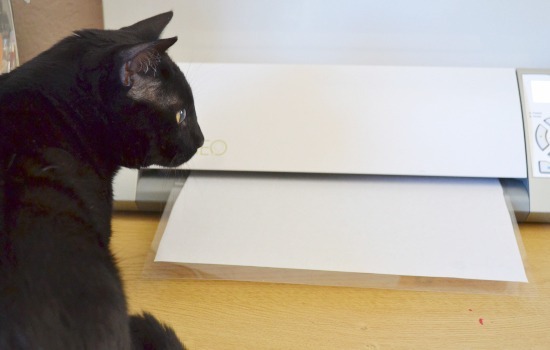 Attach your freezer paper shiny side down to the cutting mat. Use the cut settings for regular paper. 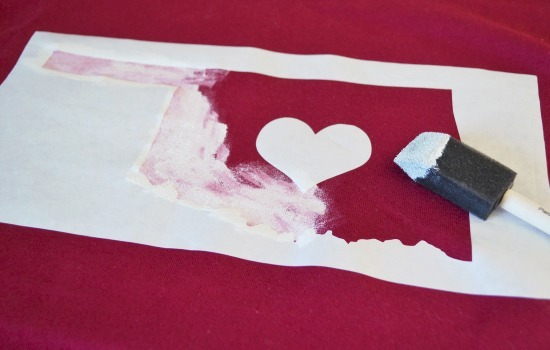 Gently weed your pieces (the paper is kind of gentle) and place shiny side down on your tee. Use your hot iron to set the freezer paper down. If applying letters as I did, you can use an air soluble marker and a ruler to help place your letters accurately. Using an up and down motion, daub paint onto the tee shirt. An up and down motion will produce less bleeding than brushing the paint on will. When the paint is dry remove your freezer paper by gently peeling away. 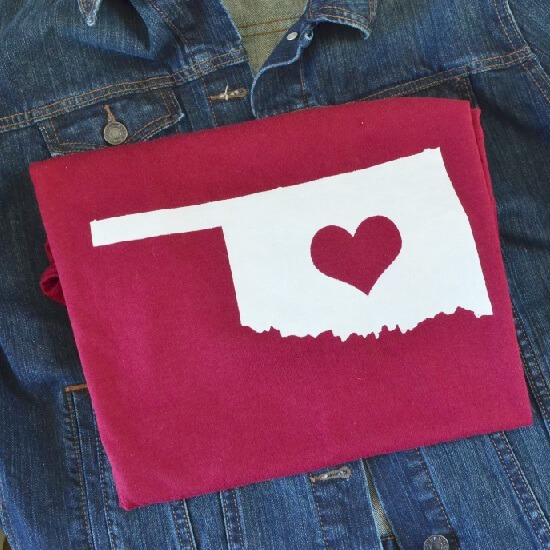 And here a tee I made myself that shows off my love for my state in the crimson and cream of my favorite team, OU! I got one shirt on sale for $2.50 and the other for $3.50 so these were some pretty cheap shirts. My freezer paper is pretty darn old and I couldn’t get it to stick as well as I’d like so there is some bleeding that happened. At least I think it happened because the paper is so old. If you have any thoughts on this, let me know in the comments, please! 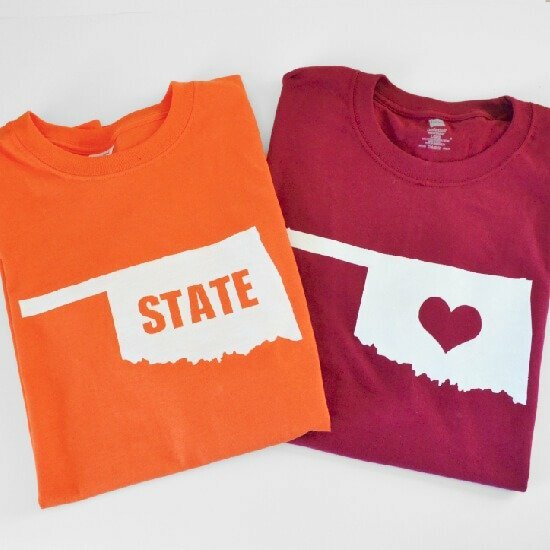 So grab your free Silhouette state cut files and get to making some cute and cheap tees! Wow! What a nice idea! Designs are really cute! Let me know if you plan making one for Belgium…hahaha…to bad I don’t have a Silhouette :(. Have a nice WE! You rock! Thanks so much for this!! How sweet are you to make all these free downloads?! I grew up in KS a half mile from OK, but am now a Missourian and am super excited for the options here. Thanks so much! You’re awesome! Thanks so much for putting these out there. Love your work and it gives me lots of great ideas. I’m so glad that you like it and that the files will be helpful, Sandi! I absolutely LOVE this project! THANKS so much for sharing all these state files…YOU ROCK!! Love these! 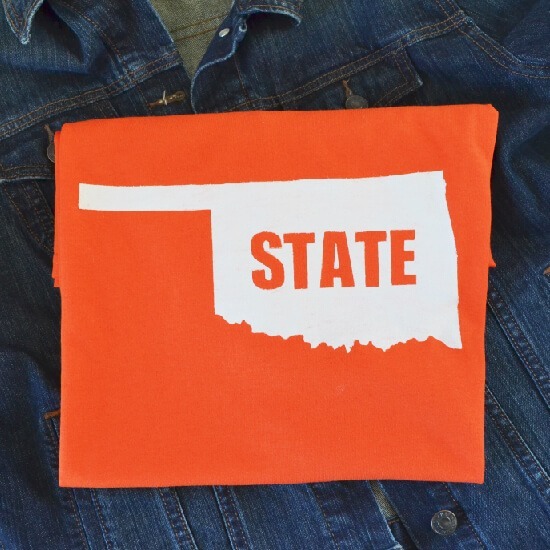 Thanks will be making a few for my kiddos- have one at OU, one at OSU and one at UCO!!! Thank you so much! This will make such a cute cheap gift! GO VOLS! The Vols are University of Tennessee Volunteers. Great ideas, BTW. I am waiting for Silhouette delivery TODAY!!! Wow…this is awesome! 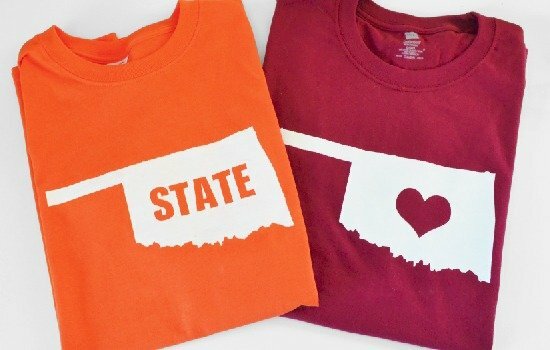 State shirts and frames have been a to-do on my list for a while now! And I’m with Bridgett…Go Vols! I have learned so much about freezer paper stencils by trial and error from painting various sayings and monograms on canvas to sell at a craft show. I iron the freezer paper onto the fabric and paint it immediately or it tends to bubble up a bit and cause the paint to bleed under the stencil. Another thing I discovered is that the stencil brush technique (dabbing the paint on) doesn’t work quite as well as just using an artist brush and painting it on. I found a tip somewhere (probably on Pinterest) that suggested flipping the design on the Silhouette software and cutting the freezer paper with the shiny side up. It seems to cut much better that way. I have also used these techniques for painting some t-shirts. Hope these tips are helpful! Thanks so much for the state cut files!! Thanks for the cut files of all 50 US States! You’re amazing! Thank you for doing this. What a lot of work!!! Thank you so much!! This is amazing! What kind of paint are you using? How does it wear? Love these files!! Thank you! I almost always use Tulip Soft Fashion Paints! They are the best as far as consistency and they wear beautifully! Thank you so much for sharing this! I was about to try and do it myself for my granddaughter’s room. My computer must be too old to have these come up properly. I just keep getting error messages and then asking me where I want to open them up in. I choose word but it just came up as symbols all over. sigh. You’ll need to open them in Silhouette studio. Will this file work on a Mac? I got message saying not supported. I believe it should work on a Mac. What version of Silhouette Studio do you have? I couldn’t open the files. What am I doing wrong? What program are you trying to use? Someone has adapted your state files for an idea of the US map on burlap as a wall hanging to track ROW X ROW travels on … we LOVE this idea too! 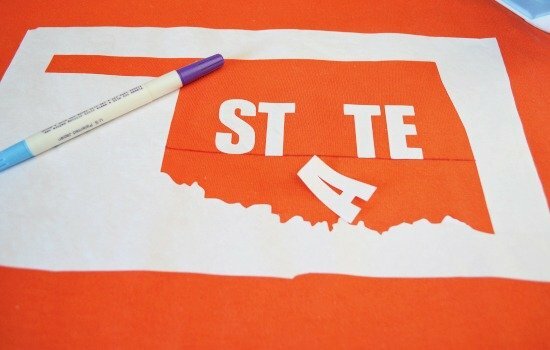 Scrap fabrics different for each state and markers for each quilt shop visited…. Thought you might be interested to see your brain child blossoming farther as a hybrid. Thanks SO MUCH for these great files! Does one have to have permission to use a state stencil, to make products to sell in a personal business? 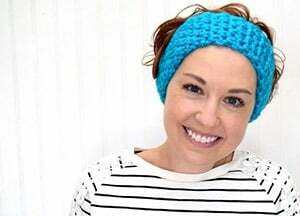 Shoot me a quick email allison @ dreamalittlebigger.com with what you intend to do with it and we’ll talk. Thanks! Thank you so much for sharing these files! They are great.